The innovative adapter developer, Techart, who has previously launched the first autofocus adapter for manual lenses, has unveiled the world’s first Autofocus adapter for Canon EF lenses & Fujifilm GFX 50S camera. The Techart EF-GFX adapter provides autofocus function as well as in-body aperture control for using Canon /Sigma EF-mount lenses on the Fujifilm GFX body. Techart has tested extensively on the modern Canon / Sigma EF-mount lenses in the market and found the autofocus performance on the GFX is satisfactory. 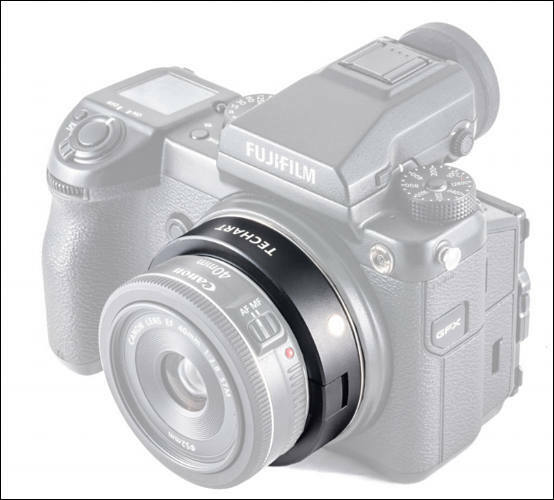 Aperture of the lenses can also be adjusted on the camera by simply turning the command dial. The EF- GFX adapter currently supports AF-S mode for shooting and supports the lens Image Stabilization function (if applicable). Focal length and aperture data will also be saved into the adapter. Techart is also working to unlock the AF-C and video-shooting feature. It is expected to be seen in future firmware release. The firmware of the adapter is user-upgradable and can be done by simply plugging the adapter into a computer via the Micro USB cable and running the update program. The short flange distance of Fujifilm GFX 50S provides a perfect platform for adapting different mount lenses. Although not every one of the full frame EF-mount lenses has a big enough image circle to cover the GFX sensor, Techart EF-GFX adapter still opens up a wide range of lenses options for GFX users to consider. The Techart Canon EF – Fujifilm GFX Autofocus Adapter is currently available for pre- order at our official website (http://www.techartpro.com). The recommended retail price is USD 499/pc. Free shipping will be provided during the promotion period. Delivery will commence from mid Oct onwards. 1-year warranty is included.